Deuteronomy 8:10 "And you shall eat and be full, and you shall bless the Lord your God for the good land he has given you." From Luther’s Large Catechism (1529): "Almighty God our Father, your generous goodness comes to us new every day. By the work of your Spirit lead us to acknowledge your goodness, give thanks for your benefits, and serve you in willing obedience; through your Son, Jesus Christ our Lord, who lives and reigns with you and the Holy Spirit, one God, now and forever." Oh, give thanks to the Lord, for He is good and His mercy endures forever. Lord God, heavenly Father, You have created me and endowed me with all that I am or have as a pure gift of Your "fatherly, divine goodness and mercy, without any merit of worthiness in me." You sustain me from day to day with the gifts of daily bread in the food that I eat, the family that surrounds me, the friends I enjoy, the country where I live, and countless other benefits that I constantly receive from Your open hand. On this Day of Thanksgiving, cause me to gratefully remember the good gifts that You shower upon me. Deepen in me the knowledge of Your goodness, and awaken my heart to praise You for all of Your gifts, especially the forgiveness of sins that You have purchased and won for me and the whole world in the atoning death of Your Son, Jesus Christ. Keep me mindful of Your mercies every day, and grant that I may thank, praise, serve, and obey You not only with my lips but also with a life dedicated to the service of my neighbor. To You, O Lord, Father, Son, and Holy Spirit, be all honor and glory, praise and thanksgiving, now and forever. Amen. 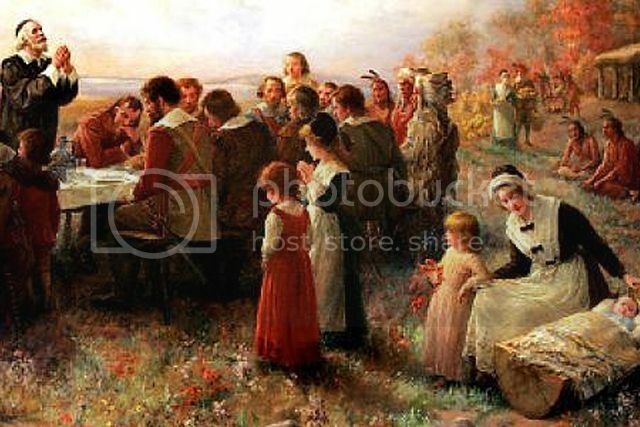 In a Lutheran layman's terms, blessings to you and your family on this Thanksgiving Day! NOTE: As you know, I am a newly converted Confessional Lutheran who recently escaped American Evangelicalism a little over a year ago. That being said, please contact me ASAP if you believe that any of my "old beliefs" seem to have crept their way into any of the material you see published here, and especially if any of the content is not consistent with our Confessions and Lutheran doctrine (in other words, if it's not consistent with God's Word, which our Confessions merely summarize and point us back to) so that I can correct those errors immediately and not lead any of His little ones astray (James 3:1). Finally, please be aware that you might also discover that some of the earlier pieces I wrote on this blog back in 2013 definitely fall into that category since I was a "Lutheran-In-Name-Only" at the time and was completely oblivious to the fact that a "Book of Concord" containing our Confessions even existed. In addition, there are some entries that are a little "out there" so-to-speak since the subject matter was also heavy influenced by common Evangelical concerns/criticisms that aren't that big a deal for us Lutherans. I know that now and I'm still learning. Anyway, I decided to leave those published posts up on this website and in cyberspace only because we now have this disclaimer and only to demonstrate the continuing work of Christ and the Holy Spirit in my life (Hebrews 12:2; Philippians 1:6). Finally, please know that any time we engage in commenting on and/or interpreting a specific portion of the holy Scriptures, it will always follow the verse-by-verse notes from my Lutheran Study Bible unless otherwise noted. Thank you for stopping by and thank you in advance for your time, help, and understanding. Grace and peace to you and yours!